Use on wood, galvanised steel, plastic, concrete brick and cladding. Excellent resistance against cracking, blistering and flaking. Prevents rot and algae build up. 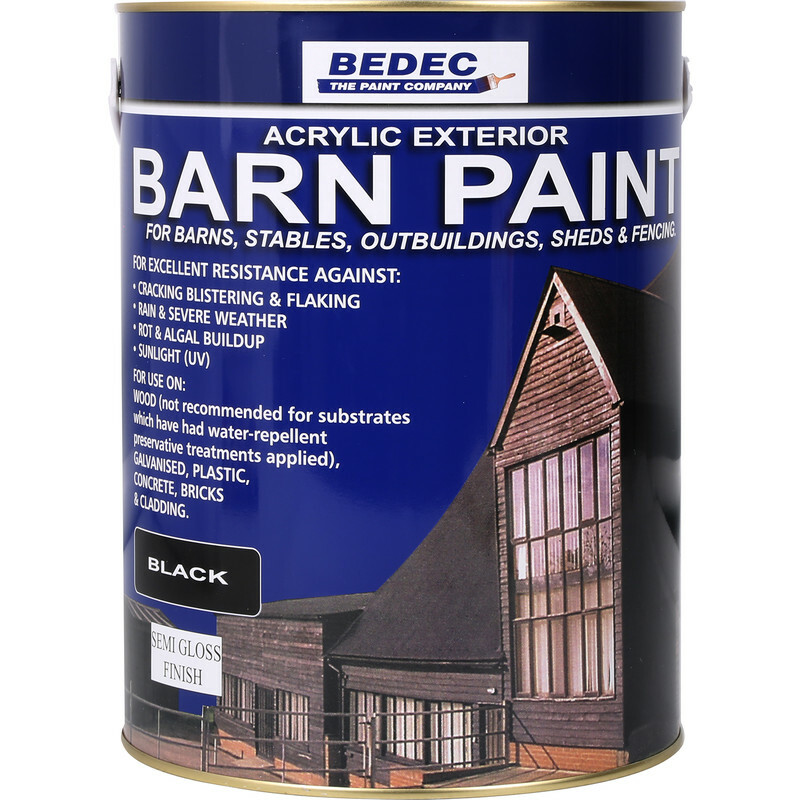 Bedec Barn Paint Semi Gloss Black 5L is rated 4.9 out of 5 by 10. Rated 5 out of 5 by Davemet from Excellent Easy to apply exterior paint I bought this a while ago and recently used it on our garage doors. I applied 3 coats as suggested allowing a day between coats. It is water based and very easy to apply giving a tough finish. It was recommended by a trade person. The paint i used used was the white and not the black as mentioned above. Rated 5 out of 5 by Markz from Great Quality paint Good paint, spreads really well with great coverage. Rated 5 out of 5 by Brettbery from Good coverage. High quality product and great to apply specially to bare wood. 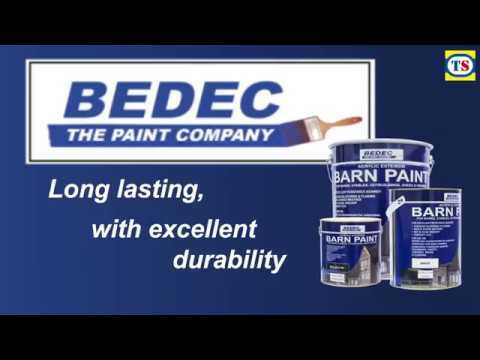 Rated 5 out of 5 by Podster AB from Bedec barn paint semingloss First coat excellent on everything, but some streak gaps on plastic coated aluminium, , second coat fixes that. Used on; fresh wood, weathered wood, previously saddling treated wood, raw aluminium and recycled aluminim plastic sandwich advertising panels with a pride vinyl wrap surface. Brushes clean out in water, but detergent reommended as well. Rated 4 out of 5 by Andynant from A good paint for exterior wood The paint has done the job I wanted it to. My project is coverting a shed into a Tudor style barn. Two coats are needed, but it adheres well and provides a good coat to wood and metal. Rated 5 out of 5 by Dixie00000 from Long long lasting Used this paint for about 12 years. Painted a Barn and various other buildings, decided to re-coat after 10 years but it didn’t really need it - I’m just fussy. If new wood I suggest 3 coats at first, not essential but will save you doing it again for over 10 years.